This Notorious Murderer Kills the Deputy Warden of Joliet, Ill., Prison. Joliet, Ill., March 1. — A murderous assault was made upon Capt. John McDonald, deputy warden of the penitentiary here, this afternoon. The assassin is a notorious desperado name Frank Rand. Deputy McDonald in going his rounds entered the collar shop where Rand works. As customary, McDonald stopped at the desk of Keeper Madden to receive his report. While the deputy was talking with the keeper Rand snapped his finger at his keeper and raised his hand, giving the signal for a request to go to the closet. Madden nodded assent, and resumed conversation with the deputy, whose back was turned on Rand. The keeper also turned his back to Rand to give an order to another convict. Instantly Rand, who was crossing the room, picked up a heavy iron poker three feet long, rushed upon Deputy McDonald and struck him on the head with all his force, smashing in his skull. McDonald dropped senseless. Rand shouted “I have killed the son __ ______ at last,” and drew a large knife. Keeper Madden rushed up to Rand and received a terrible gash in an arm, but held Rand until two life convicts, Demolin and Roab, came to his assistance, and Rand was hurled violently to the floor. Hearing an alarm, Assistant Deputy Warden Garvin and Keeper Ed McDonald, brother of the attacked deputy, rushed in and the convict Roab was on top of Rand and had the life nearly choked out of him. When Garvin ordered him off, Roab begged to be allowed to choke him to death. Rand rising staggered toward the door and made a quick plunge; grabbing a knife on the table, he turned desperately on Deputy Garvin, who broke a heavy cane over Rand’s head, cutting him terribly. Pulling a revolver, Garvin shot Rand in the side, then grabbed the convict by the throat. While holding him thus, Keeper McDonald frantically drew his revolver, placed the muzzle at Rand’s right ear, and fired. Rand fell. Deputy McDonald and Rand was carried to the hospital. An examination showed McDonald’s skull terribly crushed. Pieces of skull were removed, leaving the brain exposed two inches long and one wide. He will die. Rand was unconscious a long time. It is not known how dangerously he was wounded. On recovering consciousness, Rand said: “I am Jesus Christ, and was sent to rid this prison of that cruel deputy. I think I have done it.” Rand continued, “I left a broad trail of blood all the way to prison when I came here. To do so I killed nine men. This makes my tenth.” Deputy Garvin says responsibility for McDonald’s death rests upon the jury which sent him Rand to the penitentiary instead of hanging him. During the terrible struggle the convicts behaved admirably. Tribune’s Joliet, Ill., special: Deputy Warden McDonald, who was assaulted by Frank Rand, is still very low, although his friends think there is a fair chance for his recovery. When asked why he had assaulted the deputy, Rand said: “He was cruel to me. I suffered like a being in hell while he confined me in the solitary. I had a vision from God in which I was told to “kill the deputy.” The physicians have not yet probed for the ball in Rand’s head. The other wounds are not serious. Rand is fully posted on the result of the recent trial of Convict Mooney, the murderer of his cell-mate, is up to all the insanity dodges, and has begun to get in his insane talk and actions this early, for the purpose of carrying out a plan he has evidently concocted to be declared insane and sent to an insane asylum. This is the motive for his attack on Deputy McDonald. Mr. Tunnicliff ranks high as a lawyer, and when he was State’s Attorney, he prosecuted several criminal cases of national notoriety. He prosecuted John Marion Osborn for murder, who was hanged at Knoxville, March 14, 1873, — being the first and only criminal suffering capital punishment in Knox County. 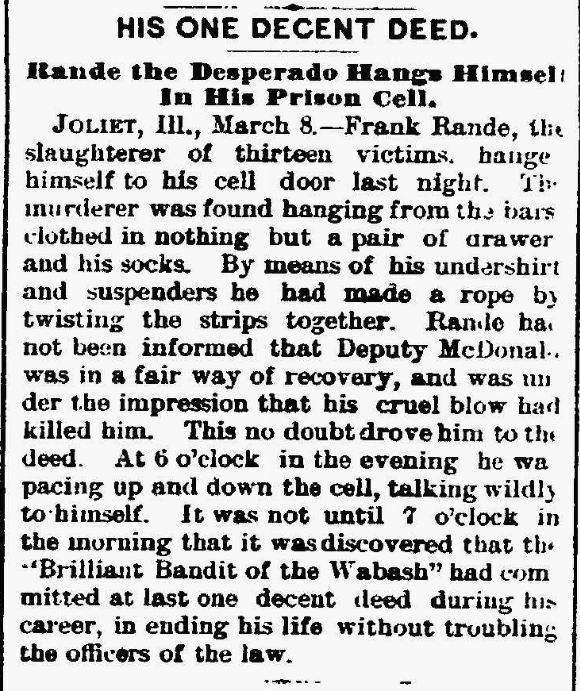 He also prosecuted the notorious “Frank Rand,” known as the “Bandit of the Wabash,” who was sentenced to the penitentiary at Joliet for life, where he tried to murder the Deputy Warden and afterwards hung himself in his cell.